For the first time in the history of Indian Supreme Court, the Court issued warrant to a sitting High Court Judge. 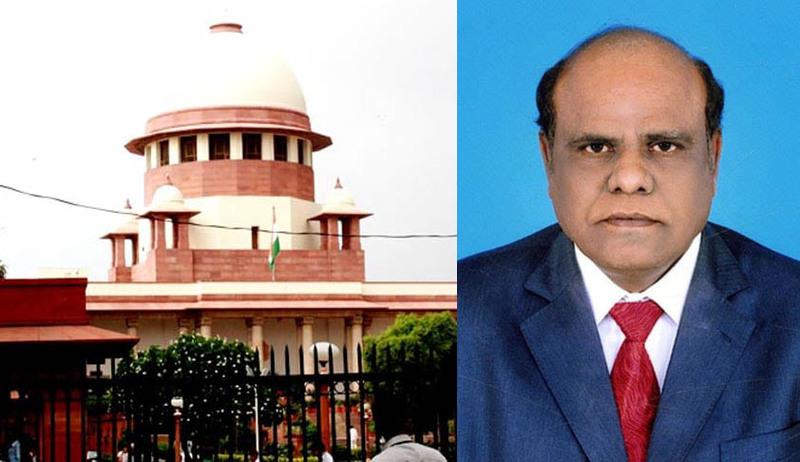 The Seven Judge Bench of the Supreme Court has issued a bailable warrant to Calcutta High Court Judge, Justice Karnan as he failed to appear before the Bench,hearing a suo-motu contempt proceedings against him. The Bench has posted the matter on 31st March. At the outset Attorney General Mukul Rohatgi urged the court to compel Karnan's presence through a bailable warrant for the charges he had levelled against several sitting and retired judges of the apex court. "Notice has been served that we got know he wrote two letters to the CJI which is again allegations against Madras High Court judges". "He passed an order at his resident but ‎the substance is not known, apparently he has raised the issue of an enquiry into Kalikho Pul issue". "Even High Court registry has no clue about the order"
"Rules provide for it",the AG vehemently argued. At this juncture CJI Khehar informed that the judge had sent a fax requesting to restore his administrative functions but it could not be treated as his response. "Despite service in person after which it was imperative for Justice Karnan to tender appearance either himself or through a lawyer. In the above view of the matter it would be pertinent to note that the registry received a fax message in 08-03-2017 seeking a meeting with the Chief Justice and judges of this court to discuss administrative issues which primarily seem to reflect allegation against certain named judges. The letter cannot be considered as a response. In view of the above no other alternative remains than issuance of a bailable warrant which shall be served on him through the DGP of West Bengal on a personal bond of Rs 10,000. This is necessary to compel his presence in the court on March 31". On February 13 justice Karnan, who was charged with contempt of court defied the order by refusing to appear before the apex court. SC then gave Karnan time until today to respond to contempt notice. At the outset Rihatgi had said Karnan was bound to appear. Referring to the letter written by Justice Karnan to SC the AG said "it only aggravated the issue as there are many more grave allegations". At this point CJI Khehar had asked "who has given the letter. How is it in public domain?" Rohatgi said it was being circulated on Whatsapp. AG had said instant action was required and it also be seen that court also acts against its own. "The defiance continues. He has not come to court and not given any reason why he is not appearing" , agreeing to it CJI Khehar said "the letter also does not say he is not going to appear". AG continued to insist that charges must be framed as he brought the judiciary to disrepute but the bench was unmoved. Facing notice and summons from the apex court, Karnan, had earlier through a letter lashed out at the apex court, accusing it of harbouring a caste bias against him. Brushing aside the contempt proceedings Justice Karnan has also said the proceedings initiated by the bench of seven senior most judges of the apex court of Chief Justice J S Khehar and justices Dipak Misra, J Chelameswar, Ranjan Gogoi, M B Lokur, P C Ghose and Kurian Joseph are “not maintainable under law” against a sitting high court judge and asked the top court to refer the matter to parliament. In the letter written to the Secretary General, Karnan accused the Chief Justice-led bench of upper caste bias in initiating proceedings as he belonged to the Dalit community. He also went on to allege that the court order amounted to an offence under the SC and ST (Prevention of) Atrocities Act and challenged the court to refer his case to Parliament. He argued that since the order against him was “harsh“, the contempt case should be heard after CJI Khehar retired or placed before Parliament if this was not possible. Karnan, who has been at the centre of several controversies, was issued a notice and asked to present himself in the Supreme Court on February 13 to explain “scurrilous“ allegations against sitting and former judges. He was charged with impeding justice administration and bringing discredit to the judicial institution of the country by writing scandalous letters about sitting and retired judges. Recently Justice Karnan had written a letter to the Prime Minister Narendra Modi listing the names of 20 judges of various High Court and Supreme Court leveling corruption allegations against them and seeking a CBI probe. He had earlier written to the National Commission for Scheduled Castes, levelling charges of anti-Dalit bias against the chief justice of the Madras high court in 2014 when he was a member of the bench there. Referring to the February 8 order that also stripped him of judicial and administrative work, Karnan said: “The characteristic of this order clearly shows that the upper caste judges are taking law into their hands and misusing their judicial power by operating the same against a SCST judge (Dalit) with mala fide intention to get rid of him".